On a chilly Friday in March, my coworker, Bekah, wrapped up my team’s daily status meeting with our new ritual: she opened Georgetown Cupcake’s twitter feed for the secret flavor of the day. This cupcake would be given away, free, to the first 100 customers who ordered it by name. Running on just a cup of coffee, I waited to see if this could be a plausible snack to hold me over until lunch. “Chocolate Ganache Surpise,” Bekah read, as I shook my head and wandered back to my desk. But wait, why was I turning down free cupcakes? Wouldn’t it be delicious? Well, yes, all of Georgetown’s offerings are superb, and they brew a solid cup of Illy coffee. During our early days of cupcake freeloading, I would have happily made the trip across the street. But by that point I had learned to skip ganache days. Ganache is a chocolate mixture that is typically used as a glaze or icing. It’s rich and delicious, and perfectly complements cupcake flavors such as strawberry and banana. The problem is that Georgetown uses ganache as a substitute for frosting, and when you are checking free cupcake flavors five days a week, you hold out for frosting. Ok, we may not be quite the cupcake snobs I make us out to be, but you just can’t take a free cupcake every day of the week (for several reasons). There has to be a filter, and it’s not that the ganache icing is bad, it’s that the frosting is really really good. It was so good, in fact, that we began viewing things in binary: frosting or ganache. It got to the point where it almost didn’t matter what the flavor was; if it had frosting, we were a go. You’d think that would have brought us to Georgetown pretty often, but, even though ganache flavors made up only a small fraction of the overall menu, they showed up as free flavors more than half the time. And we paid attention. In fact, we started to notice a pattern. For some reason, Mondays seemed to be a good day, with a high chance of frosting, while Thursdays were almost a sure bet to have ganache. This started as a hunch, a casual conversation piece, but I needed to gather some data. I collected the past year’s worth of Georgetown’s free flavors (see my methodology at the bottom) and sliced up the data in various ways. The first & foremost of my questions was: is there a correlation between day of the week and whether a flavor will have frosting or ganache? The data backs up our original hunch. For whatever reason, Mondays have the highest chance of frosting, while Thursdays have the lowest, getting frosting less than a quarter of the time. But is this data meaningful, or just random? Here I have the same data broken out by Month. This shows that the “Monday is good, Thursday is bad” pattern was consistent throughout the year, with only February and October as major anomalies. You can also see here which months had more days of frosting. July was a good month, as was August, but that may have been random because Georgetown did a Shark Week promotion in August. 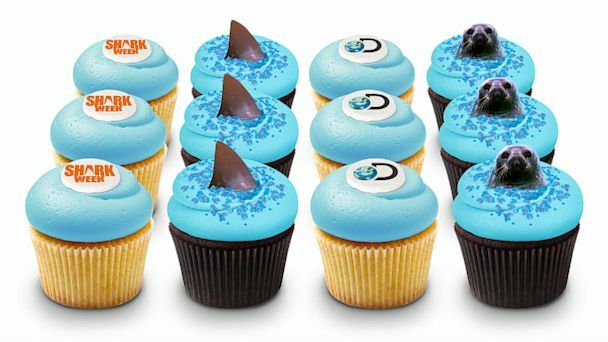 For a week, they topped each cupcake with a fondant shark fin that probably required frosting to stay in place. Lately it’s seemed like ganache has been on the rise. I wondered if this is really the case or just my faulty memory or confirmation bias. This shows the chance of frosting averaged over a trailing 30-day period for the past eleven months. This fall has definitely seen a noticeable downward trend, and we are experiencing the most ganache in my year’s worth of data. But similar trends happened last winter, and, to a lesser extent, in the late spring. So it’s probably too soon to declare anything definitive. Maybe the upcoming holiday season will bring the numbers back up. Here are the top ten most common free cupcake flavors from Georgetown Cupcake in the past year. Most of these are ganache, but luckily two of my very favorites are also in this list: Chocolate Salted Caramel and Strawberry Lava Fudge. If you like the combination of strawberry and chocolate, I highly recommend keeping an eye out for this one. Unfortunately, as of this writing, the last time it appeared as a free cupcake was all the way back on July 14th. In addition to those two, my favorite free flavors are: Chocolate Maple Fudge (by far my favorite), Peanut Butter Banana Fudge, Triple Caramel, and anything Sundae. To gather a year’s worth of free cupcake flavors, I used the Twitter API. The code I used is in Github. Once I had the raw data, I pasted it into a Google spreadsheet and manually assigned each flavor a Yes/No value based on whether it was topped with ganache or frosting. When looking at a Georgetown Cupcake free flavor, there are a few keywords that tip off a ganache topping. Obviously, “ganache” itself is a clear signal, but others include: dipped, hazelnut, blond, and surprise. At least I’m pretty sure of that last one. Many of the holiday cupcakes are “surprise” flavors, and the ones of these that I’ve actually gotten have always had a ganache icing with a fudge or frosting center. AS ganache cupcakes go, they are not bad at all. On the other side of the coin, “chocolate chip” generally indicates that the cake portion has chips in it, and that it will have frosting. A big thanks to Bekah for helping me correctly assign ganache/frosting to all of the flavors. I used Google Charts for all of the visualizations in this post. This entry was posted in cupcakes, software dev and tagged cupcakes, data, frosting on November 23, 2014 by rob.